Our Secretary Charlie Lynch will be joining us to discuss his paper on the 1970s Television series, Adam Smith. 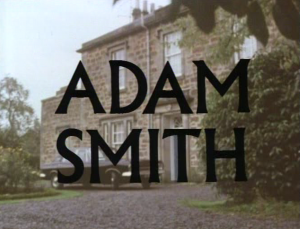 Adam Smith was co-written by the left-wing playwright Trevor Griffiths and starred Scottish character actor, Andrew Keir, and was produced with the assistance of the Church of Scotland. It depicted the life and struggles of a parish minister in a fictional village in the Scottish Borders. Charlie will discuss how the series can be analysed as a depiction of the Kirk and Scottish society in an age of rapid social and cultural changes. Charlie will pay particular attention to the themes of religious crisis and sexual revolution. Considering their representation in Adam Smith in terms of wider historical understandings of the period and through doing this, he will seek to draw connections between sexualities, gender and religious change. In Adam Smith, Trevor Griffiths argued that in order to be relevant to British society in the 1970s, the Church of Scotland had to adapt to these changed conditions, challenge economic and social injustices and through doing so, rediscover a more authentic Christianity. Wine reception to follow. Our events and talks are free and open to the public, member and non-members alike. We are a non-profit organisation that receives no funding from external groups or the government. Our campaigns and events are funded by the generous donations of our members and supporters.